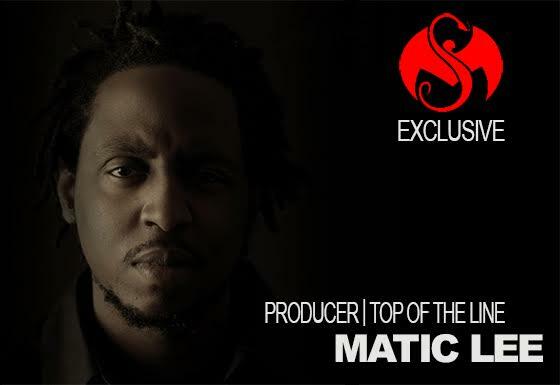 Continuing the roll out for Rittz’s Top Of The Line, we had the chance to interview Matic Lee, a name that can be found throughout Rittz’s credits, as well as many other Strange Music productions. Matic laid the foundation for a few tracks off of Top Of The Line, including “Diamonds And Gold”, “All Night I’m”, and “Day Of The Dead”, the track we recently heard so much about in our interview with guitarist Corbin King. Outside of Rittz’s upcoming album, Matic has a long history with Strange, going back to Tech N9ne’s “Red Nose”, “One Good Time”, and more. In order to find out more about Matic Lee and his work on Top Of The Line, we gave him a call. How did you meet Rittz? Was it through Strange Music or did you have that connection before? I actually met Rittz while I was living in Nashville. The whole Strange Music thing was crazy to me because I had no clue that that was even going to be going on when I had initially met Rittz in Nashville. It’s beautiful now and everything is coming in full circle. He’s working with Tech and I’ve been working with Tech. It’s a wonderful partnership. What’s the production process like with Rittz? Did he just hit you up with the sound he was looking for or did you guys have the chance to get in the studio? Being that I engineer and all these other things, I really don’t make as many beats as I used to. It had been like a year and I hadn’t sent Rittz any beats. With Top Of The Line, we weren’t able to get into the studio for one reason or another, but we definitely would text back and forth, talk on the phone, and he let me know what kind of vibe he was going for. We were able to communicate like that for the most part. It was wonderful. I definitely would like to get into the studio in the future, but Rittz is a busy man and I’m a busy man. We’ll make it happen. 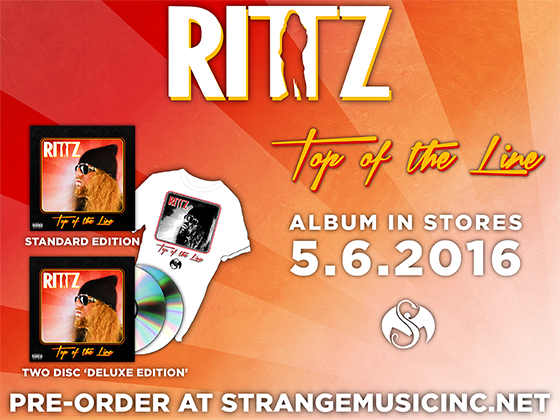 We know Rittz had a specific sound in mind for Top Of The Line, wanting to go for that retro sound. Did he communicate that with you at all? Yeah. He typed up a nice little email for the people he has been working with consistently over the years. He typed up a syllabus for us to go by, basically the types of things he was looking for as far as sounds and drums. He gave the blue print and we came as contractors to build his house. It’s good that he had a specific idea in mind, because I definitely sent him some beats that he would never rap on in his life. He definitely grabbed the steering wheel on that one and that’s really what you need. Compared to other artists that you’ve worked with, how is Rittz unique? For the most part, I enjoy authenticity in an artist. I enjoy when they’re able to convey songs that may or may not be about them but they’re relatable on a lot of different levels. Rittz does more personal stuff. It definitely sets him apart to where he’s able to not just have fair-weather fans, but has people that are willing to ride with him. I’ve seen Rittz tattoos. When I met that dude, I would never in a million years think that people would be getting tattoos of him and that fro (laughs), but that’s the kind of connection that he puts into his music. People want to ride and unify with him, his struggles, and his pains. That’s what will keep people rocking with him for the long term. What sound do you associate Rittz with? Relating it to somebody else in rap? Funny enough, I kind of find his content very similar to the story telling of Eminem. It’s more personal and it connects with people. He talks about the turn up and the turn down. He’s well rounded in that. Really, just the skill and the chopping. That’s Twista, Tech, a lot of the fast rapping cats. As far as the music up under, it’s definitely that southern “lac music”. He’s got that type of scene up under his lyrics that kind of makes him who he is. Out of the tracks that you produced for him, do you have a personal favorite? I mean, they were all jammin’. I really liked the Gwinnett County one, talking about the north side of Atlanta with Cheeto Gambine. I can’t remember all of the names, but they were definitely jammin’. As far as your projects go, do you have any artists that you’re looking to work with? I moved to Atlanta about a year ago, so I really hit the ground running. I’m working with a lot of cats. I’m working with Reese, who used to be apart of Two-9. I mixed his last project. My homie Jenkins, we’ve got some songs coming out. Jarren Benton, we’ve got some stuff brewing. I worked on “Tec In The Church”. My good partner Big Henry with Slumerican, we’ve got a project coming out that I produced a lot of the tracks on. Last but definitely not least, my band Jose & Mary. What do you think of Matic Lee’s production? How stoked are you for Top Of The Line?